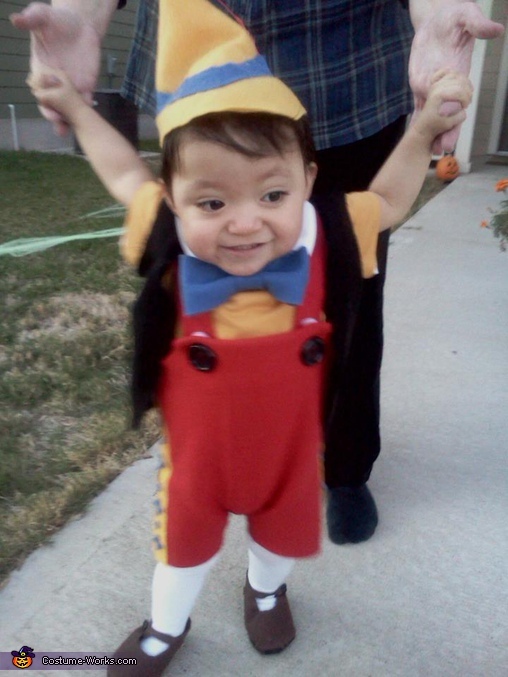 My 1yr old son loves pinocchio soo much its literally the only movie he will sit through so had to make the costume! I made the whole thing without a sewing machine.Hard work haha I only had a hot glue gun some valcrow and a needle and thread! I made the red overalls,the bow tie,shoes and hat out of felt glued on the red feather. Then used black denom material for the vest. I bought a pair of tights a yellow onsie and a collared shirt. It was soo much fun to make and everyone loved it while he was trick or treating. Thanks for letting us share. Love the costume and the fact that you hand-crafted this without the use of a sewing machine. It is an incredibly adorable costume! I really love this costume, great job considering the fact that it was made without a sewing machine and in such a short time. He loves pinocchio and that makes it 50 million times better. I hope he wins!! OMG this is the best homemade Holloween costume! its simply delightful, and Baby has the perfect doey eyes as the real animated character! Go lil PINOCHIO!! tooo cute, MY FAVORITE!!! This has been his favorite character since birth he just giggled even when he would hear the credits... WE bought him the pinocchio doll last xmas and he just hugged it soo tight when he saw it... This is definatly going in his memory box.